Covington Catholic was closed Tuesday because of threats. Police are investigating. The demonstration took place across from the Diocese of Covington. Native Americans want to meet with the Catholic Church to change what schools learn about indigenous peoples. They say they are still waiting to hear from the Diocese. Native Americans and their supporters rallied across the street from the Diocese of Covington where they are requesting a meeting. 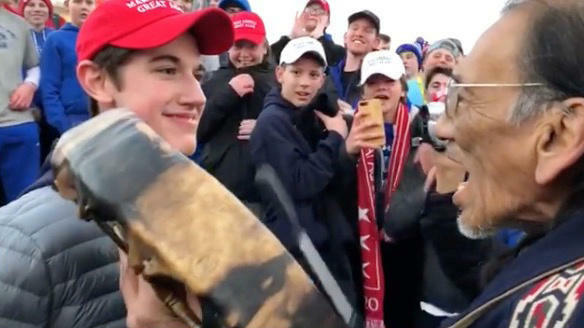 Most speakers blamed the parents of the kids and the chaperones on the trip, including Carolina Castoreno-Santana of the American Indian Movement Chapter of Indiana & Kentucky. "It's not to demonize these kids but they need the opportunity to be educated and to come out from the racist upbringing that they've had," she says. Castoreno-Santana doesn't accept they should be expected to know better. "Saying that these are just high schoolers is just like the saying 'boys will be boys' and we're not accepting that in this day and age." Nick Boschert showed up with a sign that said, "St. X/St. Ursula parent proudly supports Covington Catholic. Stand your ground." He says Nick Sandmann "showed remarkable restraint. I would be proud to have that boy as my son." Boschert balks at the idea that Sandmann shouldn't have been wearing a "Make American Great Again" hat, a slogan of President Donald Trump that some find divisive. "People are allowed to wear whatever political attire they want," he says. "They are allowed to espouse whatever political view they want and that deserves to be respected and heard." CovCath graduate Joshua Kruer says this incident exemplifies a lot of the divide in our country right now. "And it's difficult because there's quite a gap between our worlds of understanding, but I think it can be bridged," he says. Native American Guy Jones says that may take time. "We look at the entirety of it all - people are pointing and blaming each other - but the reality is this is a product or symptom that is growing as a country and we as a people have to go and put a stop to it." You've got all these young people saying let's make America great again, he says. "Yes, let's do that but let's stop the hate."